DISCLAIMER: The following is my opinion and contains spoilers for the entire Xenosaga series. 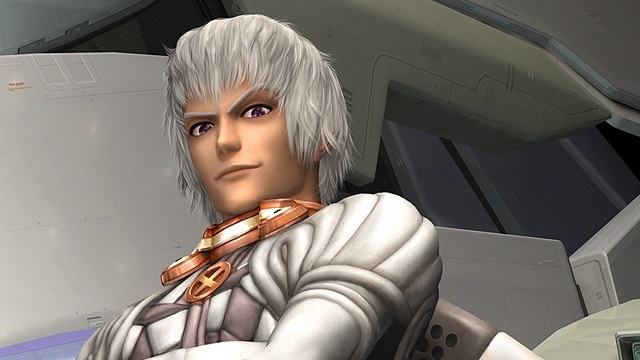 Xenosaga, being the middle child of the Xeno-prefix Tetsuya Takahashi games, has its fair share of fans and haters. You either love the sci-fi cutscenes filled with Nietzsche references or hate them for sometimes being over 30 minutes. I wear my love for Xenosaga on my sleeve; I mean, look at my author bio for evidence. Whether you loved or hated the series, anyone can appreciate a finely crafted villain. Xenosaga has a plethora of those, but the closest character to my heart in the entire series is Albedo Piazzolla. He has done terrible things: torturing and murdering many Kirschwassers, abducting and abusing MOMO, and nearly killing millions of people. But, if you look into Albedo’s complex past, you not only understand him but also realize he is one of the most tortured, human characters in the entire series. Does that excuse the physical and emotional abuse he inflicts upon people? No, it doesn’t. He’s a villain for a reason. But the tragedies he suffered his entire life explain every action. Sweet, misunderstood Albedo. Part of the URTV clone program, Albedo was born physically attached to his twin brother, Rubedo (later referred to as Jr.). As such, he was pretty close to his brother. Albedo starts off as more sensitive than Jr., constantly needing rescued. This make Albedo dependent on his twin brother. When Sakura Mizrahi, daughter of the infamous scientist Joachim Mizrahi, becomes a subject of the URTVs trials, Albedo instantly becomes jealous of her presence. Jr. and Sakura start meeting with each other constantly, leaving no time to be with his brother. Albedo laughing after tearing off his own head. This is further evidenced in Xenosaga I&II, a Japanese only DS game. Throughout the flashbacks in Xenosaga Episode II: Jenseits von Gut und Bose, you are led to believe that Albedo killed Sakura, or, at the very least, he had some part in it. However, in the DS game, it is revealed that Sakura saved Albedo from getting attacked by U-DO, getting herself killed in the process. Thus began a complex relationship with Sakura that would last for the rest of his life, as he both hated her for taking his brother from him but appreciated her saving his life. With the Kirschwassers and MOMO designed after her, it’s no wonder he felt animosity toward them. Another defining moment in Albedo’s life happens not too long after that, that being the Miltian Conflict. The URTVs were created to destroy a non-physical entity known as U-DO, and the time finally arrived for them to square off against it. However, in Albedo’s eyes, Jr. betrayed his brother once again by becoming overwhelmed by fear during the battle and severing his connection to his clone brothers. The cut connection caused many URTVs to be infected by U-DO and drove Albedo further into madness. Though Albedo does many terrible things later in his life, his life leading up to those events wasn’t exactly sunshine. As a twin myself, perhaps I relate a bit too much to Albedo and his brothers. From the very beginning of the Xenosaga series, we learn that Albedo is pretty much immortal; he can regenerate limbs and even his entire head. 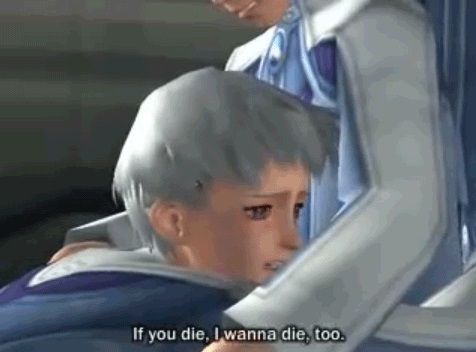 A heart-wrenching scene in Xenosaga Episode II revealed that his brothers don’t share this ability. Albedo is suddenly scared, realizing that, one day, Jr. will die, leaving him alone. You don’t have to be a twin to relate to such a feeling; everyone fears being alone, having their loved ones die. For Albedo, his immortality was a prison. From the very beginning, Albedo desires death by the hands of his own brother. But even more, he wants to be with Jr. again, just like they were before they were born. He just doesn’t want to be alone. Though Albedo’s role in the story was more subdue in the last game, Xenosaga Episode III: Also Sprach Zarathustra, he finally achieved his dream of being with his brother again. Even MOMO tells Albedo to take care while the crew of the Elsa prepared for their journey to Lost Jerusalem, though that could be some lingering Stockholm Syndrome. In the end, Albedo is one of the most tragic and complex characters in the Xenosaga series. I’d like to give a special nod to the Xenosaga Wiki, which is a good source for information on the series.